SCVHistory.com | Ripley: The San Fernando (Newhall) Pass, Part 11. The San Fernando (Newhall) Pass. 11. 1860: The Longest Stage Ride in the World. The Quarterly, Historical Society of Southern California, March 1948. 1860, June 14. An English author, William Tallack,1 left San Francisco on the Butterfield Overland Mail, returning to Europe from Australia. A mug wagon. (Not from Ripley.) Click image for info. "It being one o'clock in the morning, and a dark night, we had to be very careful that none of our respective packages or blankets were left behind in the hurried operation of changing; so we tumbled hastily into our new wagon, wrapping ourselves up in coats or blankets nearly as they came to hand, waiting till morning for more light and leisure to see which was our own. "By means of a blanket each, in addition to an overcoat, we managed to settle down warmly and closely together for a jolting but sound slumber. What with mail-bags and passengers we were so tightly squeezed that there was scarcely room for any jerking about separately in our places, but we were kept steady and compact, only shaking 'in one piece' with the vehicle itself. ... "We had now re-entered the Coast Range, and were winding down the romantic twenty-two mile San Francisquito Pass, a lovely region of tree and blossom, cliff and stream. Half way through it we had a wash and a good breakfast at a ranch, where we were warned that a hunter had that morning shot a bear a little lower down the valley, that the animal had only been wounded, and had retired amongst the trees and rocks close to our route, whence he might possibly make his appearance on our passing by. To the disappointment of the passengers, nothing was seen of him. "In the afternoon we entered the San Fernando Pass, a short but a very stiff one. Here our vehicle stuck fast in a narrow gorge. The horses could not move it, though aided by ourselves. Happily there was a waggon [sic] just behind us, whose team we borrowed, and, by dint of pulling and pushing all together, we soon got up the ascent. "This was the only time during the journey that we came to a deadlock, and it was also the only time that we were travelling in company with another vehicle going in the same direction. "On emerging from the San Fernando Pass we came to a new aspect of country and vegetation, and to a population retaining more of the Spanish and Mexican element than Northern California, as indicated by conversation and wayside notices in the Spanish language, and by the style of dress and prevalence of adobe houses. California, with the other states in the Union, felt the uncertainties and bitterness of the Civil War. There were sharp, conflicting opinions in the south of the state and in the small town of Los Angeles particularly. It was found necessary to move troops in for military protection. San Francisco May 3, 1861. Sir: The commanding general directs you to establish a camp at the most eligible position in the immediate vicinity of Los Angeles, capable of fulfilling the conditions called for in the enclosed letter of instructions to Captain Hancock, assistant quartermaster. The two companies from Fort Mojave will be included in your encampment and in your command. 1861, June 7. San Francisco. Fort Tejon will be abandoned and the garrison and property transferred to Los Angeles. Be prepared to move as soon as the order is received by mail. 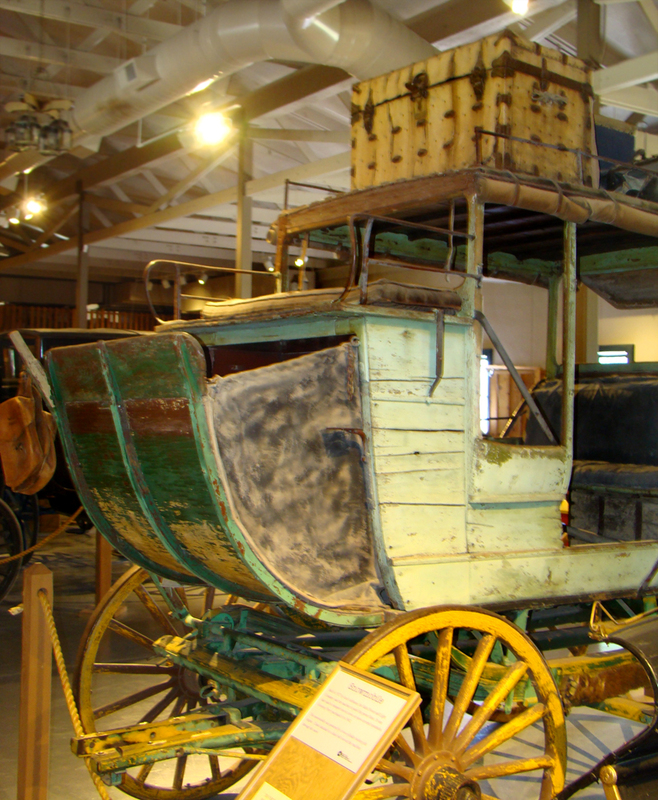 When the Butterfield Overland Mail was withdrawn, the discontinuance of the exciting arrival of the rumbling stage coaches with their dusty eastern passengers and eastern mail, left a gap in the life of the pueblo. But the local stages still crossed the valley and rattled up the stiff San Fernando Pass and through the high cut for way points beyond. With the country on tension during the Civil War, and new unrest among the Indians, neither did the loss of Fort Tejon up in the Canada de las Uvas, lessen the movement of troops over the tough grade. 1. The Overland Mail. Book One, p. 129. Walter Lang. Written by William Tallack. 2. The earthquake of Jan. 9th, 1857. 4. Overland Mail. Book One, p, 136. Walter Lang. 5. The Canada de las Uvas, now "The Grapevine." 6. A History of Travel in America. Semour Dunbar. Vol. 4, p. 1319. 7. Via Western Express & Stagecoach. Oscar O. Winther, p. 1l9. 8. Sixty Years in Southern California. Harris Newmark, p. 267. 9. Six Horses. Cap't. William Banning & George H. Banning, p. 1l9. 10. The Overland Mail. Book One. Walter Lang. Foot-note by William Tallack. p. 163. 11. The Overland Mail. Book One. p. 6. Introduction, Walter Lang. 12. Via Western Express & Stagecoach. Oscar Osburn Winther. p. 138. 13. Story of El Tejon, Part Two, p. 1l9. Arthur Woodward. 14. Story of El Tejon, Part Two. Arthur Woodward. p. 138. 16. Westside of Broadway between 1st and 2nd St. Arthur Woodward. 17. Story of El Tejon. Part Two. p. 123. Arthur Woodward.